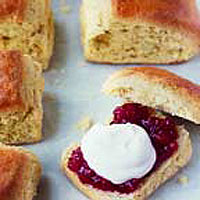 These scones couldn't be quicker or easier to make - simply roll out the dough into a rectangle and then cut into squares. With fresh butter or clotted cream and a small pot of homemade raspberry jam to hand, they are ready to be eaten immediately. Preheat the oven to 220°C, gas mark 7. Lightly grease a baking sheet. Sift the flour and the baking powder into a mixing bowl. Add the butter and rub into the flour using your fingertips until the mixture resembles fine breadcrumbs. Stir in the caster sugar. Crack the egg into a measuring jug, beat lightly with a fork, then add enough milk to the jug to measure 150ml in total. Make a well in the centre of the flour, pour in the egg mixture and mix with a round-bladed knife to form a soft dough. Transfer the dough to a lightly floured work surface and knead briefly until smooth. Roll out into a rectangle, about 15cm x 25cm and 1cm thick. Using a long sharp knife, cut the dough into 8 squares. Arrange the scones on the baking sheet so that they are nearly touching. Brush the tops of the scones with a little of the milk. Bake for 15-20 minutes or until well risen and golden. Cool on a wire rack. Scones are best eaten on the day they are made, or allow them to cool and then freeze them in freezer bags for up to 1 month. When brushing the scones, make sure that only the top surface is coated with milk. If any dribbles down the side, the scone won''t rise evenly.